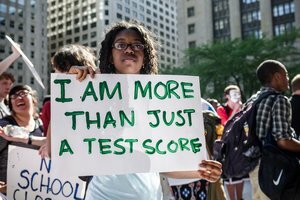 This campaign challenged Rhode Island's testing policy that would have required tens of thousands of students to pass an exam to graduate high school. With multiple years of creative, memorable actions, PSU led the fight against the policy and ultimately eliminated the requirement in all Rhode Island schools. Before this campaign, only students living 3 miles or more away from school were eligible to receive a bus pass from Providence Public Schools, meaning some students had to walk up to 6 miles round-trip to go to school. The Walk in Our Shoes campaign focused on getting decision-makers to experience what it was like for many students to get to school, with the goal of reducing the minimum home-to-school radius required for a bus pass. PSU pushed the City to reduce the radius to 2.5 miles in 2015 and to 2 miles in 2016, allowing over 1800 additional students annually to be eligible for bus passes. Over 90% of Providence students are youth of color, but you wouldn't know it by looking at the Providence Public Schools curriculum. Without culuturally relevant coursework, students struggle to see themselves in the material and as important voices in our world. So, in 2016, inspired by similar fights in California, Arizona, and Texas, Providence students decided it was time to fight for Ethnic Studies in their schools. This fight is still ongoing! Crumbling buildings, deteriorating infrastructure, and unsafe health conditions have been a fact of life in Providence high schools for too long, adversely affecting students' health and education. In 2015, PSU launched a campaign to Fix Our Schools: calling for an end to the moratorium on school construction in RI, and for greater investment in school repairs. This campaign will continue until we realize our vision of a safe and healthy learning environment for all students.